All participants in Fiction Unboxed with the guys at Self Publishing Podcast got a free copy of Writer Dad by Sean Platt. I started reading it on my phone as soon as I was able to download it and finished it in one sitting (with a few minor breaks for coffee, tousling my four-year-old’s hair, nodding to my wife and cooking some food). It’s a moving story and one that will be familiar to any writer parent. Sean talks about his struggles with school, money, relationships, parenting and trying to break through as a writer. It’s a very personal book and Sean wasn’t even sure he was going to publish it because it felt too private, but in the end his wife, Cindy, and those who read it encouraged him to put it out there in the world. As a writer dad myself, struggling with many of the same issues, Sean’s book inspired me to keep going, to keep writing, to keep discovering what my journey will be. Writer Dad is a romantic love story, an adventure in possibility and an inspirational book for all the “writer parents” out there. Buy it and read it, you’ll be glad you did. Click on the cover below to get your copy now. Please leave me a comment about your experience as a Writer Dad or Mom. I’d love to hear your story. Vassar College’s student bookstore is moving their premises and they are liquidating all of their hardcover books. This is great news for me because I got to pick up Josh Bazell’s Beat the Reaper for $1! I agree. I always know I’m going to have a great time when I pick up a book in a bookstore and before I know it, I’ve raced through Chapter One. It’s a fun read and there are sharks and mobsters and medicine and doctors and plot twists and turns and a lot of violence, but a really funny voice in the first person narration of Pietro “Bearclaw” Brwna, the narrator. If you find it, pick it up, (or click on the image and order from Amazon) it’s a great summer read. Leonardo DiCaprio was slated to play Bearclaw if they make into a movie. (That was five or more years ago) I didn’t know that before I read the book, but I could definitely see the film as I was reading it. Drop me a line if you pick it up and let me know what you think! I found this faded Bantam Books paperback edition from 1971 for $.50. It was on a discount books cart outside the wonderfully indie Inquiring Minds Bookstore in New Paltz, NY (I’m a frequent buyer) and the pulp illustration on the cover grabbed my attention. 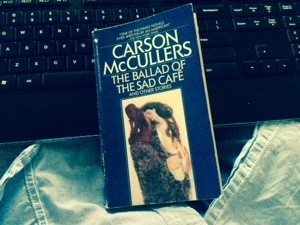 I’m also a fan of Southern Gothic and knew that Ms. McCullers would be spinning quite a story inside the yellowing pages. I found myself thinking about Miss Amelia, Marvin Macy and Cousin Lymon all day today. The loneliness and sorrow that permeate this story will follow you around like a stray dog on a back-country road begging for a scrap of meat just before it falls over dead from starvation. It’s that devastating. You can get a copy of the film at this affiliate link (thank you!) at Amazon.com.